Supermarkets are rushing to beef up their foodie images. The horse meat scandal has undoubtedly played a part in this, but alongside has been a growing desire from customers simply wanting to know where their food comes from. While Tesco is fast tracking the process by snapping up small boutique independent chains to enhance their image, such as Euphorium (see last issue), Waitrose are entering the provenance game seriously, tackling the issue at its roots, by opening a farm shop on its 4000 acre farm which is the Leckford Estate. Using the estate’s produce and that of around 60 other local suppliers, they are planning to establish a farm shop brand which can then roll out to other Waitrose stores. In May when getting off the bus at the bottom of Grays Inn road, I was struck by a brightly coloured unit I hadn’t seen before, clearly selling great coffee and food, judging by the smells. It looked like a fully formed brand, and I was surprised it hadn’t crossed my radar. It turned out to be the first day for this third branch of a mini chain called Farm Collective. Inside, was one of the owners busying around with a team of friendly staff. Dom and I had a brief chat and I was intrigued by the whole concept and felt they were trying something new. I loved the gaily coloured French metal cafe chairs, blending in with the distressed bright green barn doors inside fixed below the glossy bottle green and white brick tiles. Elsewhere wooden crates were stacked up on top of the chiller stamped with FARM COLLECTIVE as though there had just been a delivery from the countryside. The sandwich bar/cafe market is definitely due for a shift. Of course there are stalwarts like Pret and Eat who continue, with minor adjustments, to do what they have always done, and continue to do it well. The are also many small independent sandwich bars with just one shop who succeed and or fail in varying degrees. And other chains who deviate into the healthy eating sector focussing on salads like Toss’d, or bowl food as at Pod. But for the most part, we are still stuck on fillings between two pieces of bread as the default take away food. So, a few months later, I arranged to interview Dom Kamara in the Farm shop in Grays Inn Road. 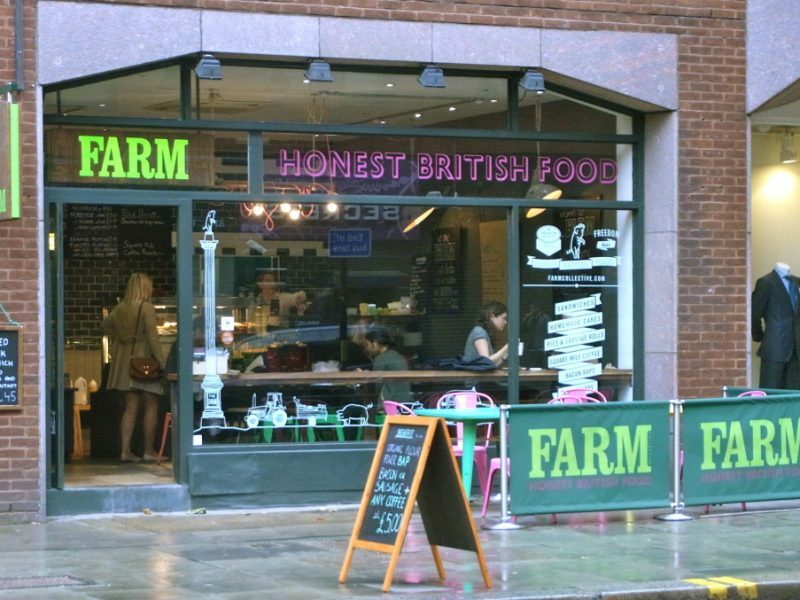 I had got to know the business better since the opening in May, with its strong Honest British Food message singing out, but was keen to hear the full story. It was Dom’s business partner Craig who defined the brand and gave it the mature look it undoubtedly has. He expanded Dom’s original idea of Simply Pies into a broader concept with the title Farm Collective. The idea was to ride on the back of weekend farmers’ markets bringing the best of UK food to the city during the working week. Craig is a brand strategist which is a strong asset for any business, but is rarely found in takeaway food start ups without major backing. The ultimate goal is to partner with a larger body like a supermarket, and so to have a strong look from the outset for that purpose is a huge advantage. But it was Dom’s passion which kick started the idea to have his own business. He had always regarded the likes of Richard Branson as a mythical breed of which he wanted to be a part. Born and raised in Cornwall, riding the waves was an integral part of his upbringing, and when some surfing pals started the West Cornwall Pasty Company at the end of the nineties, an immediate thought was if they can do it, it can’t be so hard. This gnawed at him for a further five years until an appraisal meeting in London at his job as a manager at the European Bank for Reconstruction and Development in 2005 flagged up an image of his life before him, and he realised he wanted a different future. After giving in his notice he went off on a two month surfing trip in France during which time a lot of ideas were bandied around with friends who came and went. Craig and he became fairly sure they would set up a business together in which Dom would be the working partner. Neither had any experience of working in the food business, but an opportunity to open a unit in Bethnal Green under the railway arches in 2007 offered a chance to learn about production without enormous overheads, and provided some reassurance to friends who were putting up investment. And it was tough. Dom says he found the hardest thing was to marry up the cost of the best ingredients against the highest price that people were prepared to pay. The customers of this business were in offices in the City to where the sandwiches were ecologically transported by cargo bikes sourced in Amsterdam. And this is how the food made in their first and largest site in Farringdon, founded in 2009, is still distributed to the other units. So what does Farm Collective actually sell that’s so different? 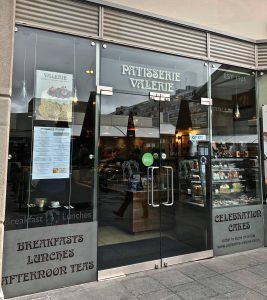 Like many daytime venues, it sells sandwiches, salads, tray bake cakes and hot drinks. What lifts it above most other independent sandwich bars is the attention to detail on the choice of suppliers. The tea is from the Tregothnan estate in Cornwall, the only place in England where tea bushes are grown commercially. The coffee is roasted by Square Mile, widely regarded throughout the restaurant world as one of the best producers in London. And for a short burst at lunchtime there is an intense push on hot food: the beefsteak and other pies in the range come from North Yorkshire (and I can tell you that the pastry is meltingly wonderful). Or else the food is made in house. To satisfy the demand of the three outlets for supply, the kitchen shift in Farringdon starts at 4.30 am. I suggest that they are taking their expansion very slowly and carefully. The second tiny Throgmorton branch, hardly more than a kiosk, by Threadneedle St was apparently offered with such a good rent deal in 2012 it was difficult to refuse. And once a new second link had been forged the next one naturally followed on. Five months after opening, Dom admits that the Gray’s Inn Road shop has been tough. It is not an easy location to crack. It’s as though everyone is rushing on buses down to Holborn, and there over the road is the seemingly impenetrable wall of Gray’s Inn. With my consultant’s hat on, I would say the cold food offering might need a bit more love and expertise. Both salads and sandwiches are made in the central kitchen in Farringdon. The intentions are there: organic bread from Flour Power City, and good provenance as regards the ingredients, but there is not quite the wow factor of the hot food. I tried the salt beef and dill mayonnaise granary baguette, and Wiltshire ham and cheddar granary sandwich, both at £3.70. Both of these tasted OK, the seasoning was well balanced, and the pickle in the sandwich was sharp and tasty. But the baguette was not crusty enough and the selection generally just needs a bit more pizazz. And maybe a good range of British produced drinks in the chiller would be an easy way to liven the display. But these are superficial niggles. I am confident these guys will get there, and in the meantime, the formula works like a dream on their site in cosy Cowcross Street, where the queues snake around the shop at lunchtime. Dom is modest and knows there is some way to go till they get it all completely right. But they’re definitely on to something.